The history of Rome for the fifty-six years that elapsed between the battle of Zama and the last act of the tragedy, the Third Punic War, tells of a hard ungracious expansion of power abroad and of a slow destruction, by the usury and greed of the rich, of the free agricultural population at home. The spirit of the nation had become harsh and base; there was no further extension of citizenship, no more generous attempts at the assimilation of congenial foreign populations. Spain was administered badly and settled slowly and with great difficulty. Complicated interventions led to the reduction of Illyria and Macedonia to the position of tribute-paying provinces; Rome, it was evident, was going to «tax the foreigner» now and release her home population from taxation. After 168 B.C. the old land tax was no longer levied in Italy, and the only revenue derived from Italy was from the state domains and through a tax on imports from overseas. The revenues from the province of «Asia» defrayed the expenses of the Roman state. At home men of the Cato type were acquiring farms by loans and foreclosure, often the farms of men impoverished by war service; they were driving the free citizens off their land, and running their farms with the pitilessly driven slave labour that was made cheap and abundant. Such men regarded alien populations abroad merely as unimported slaves. Sicily was handed over to the greedy enterprise of tax-farmers. Corn could be grown there by rich men using slaves, and imported very profitably into Rome, and so the home land could be turned over to cattle and sheep feeding. Consequently a drift of the uprooted Italian population to the towns, and particularly to Rome, began. Of the first conflicts of the spreading power of Rome with the Seleucids, and how she formed an alliance with Egypt, we can tell little here, nor of the tortuous fluctuations of the Greek cities under the shadow of her advance until they fell into actual subjugation. A map must suffice to show the extension of her empire at this time. The general grim baseness of the age was not without its protesting voices. We have already told how the wasting disease of the Second Punic War, a disease of the state which was producing avaricious rich men exactly as diseases of the body will sometimes produce great pustules, was ended by the vigour of Scipio Africanus. When it had seemed doubtful whether the Senate would let him go as the Roman general, he had threatened an appeal to the people. Thereafter he was a marked man for the senatorial gang, who were steadily changing Italy from a land of free cultivators to a land of slaveworked cattle ranches; they attempted to ruin him before ever he reached Africa; they gave him forces insufficient, as they hoped, for victory; and after the war they barred him strictly from office. Interest and his natural malice alike prompted Cato to attack him. Figure 414: Roman Power, 150 B.C. 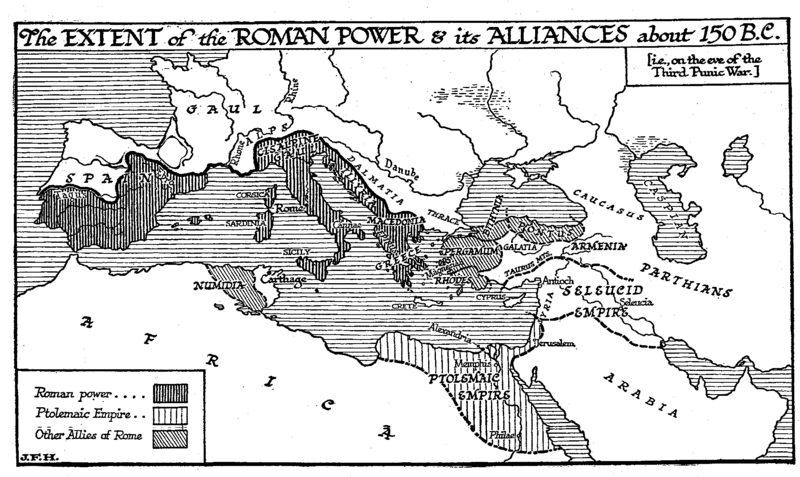 The extent of Roman power and its alliances about 150 B.C., i.e. on the eve of the Third Punic War. Scipio Africanus the Elder seems to have been of a generous and impatient temperament, and indisposed to exploit the popular discontent with current tendencies and his own very great popularity to his own advantage. He went as subordinate to his brother Lucius Scipio, when the latter commanded the first Roman army to pass into Asia. At Magnesia in Lydia a great composite army under Antiochus III, the Seleucid monarch, suffered the fate (190 B.C.) of the very similar Persian armies of a hundred and forty years before. This victory drew down upon Lucius Scipio the hostility of the Senate, and he was accused of misappropriating moneys received from Antiochus. This filled Africanus with honest rage. As Lucius stood up in the Senate with his accounts in his hands ready for the badgering of his accusers, Africanus snatched the documents from him, tore them up, and flung the fragments down. His brother, he said, had paid into the treasury 200,000 sestertia (= £2,000,000). Was he now to be pestered and tripped up upon this or that item? When, later on, Lucius was prosecuted and condemned, Africanus rescued him by force. Being impeached, he reminded the people that the day was the anniversary of the battle of Zama, and defied the authorities amidst the plaudits of the crowd. The Roman people seem to have liked and supported Scipio Africanus, and, after an interval of two thousand years, men must like him still. He was able to throw torn paper in the face of the Senate, and when Lucius was attacked again, one of the tribunes of the people interposed his veto and quashed the proceedings. But Scipio Africanus lacked that harder alloy which makes men great democratic leaders. He was no Caesar. He had none of the qualities that subdue a man to the base necessities of political life. After these events he retired in disgust from Rome to his estates, and there he died in the year 183 B.C. In the same year died Hannibal. He poisoned himself in despair. The steadfast fear of the Roman Senate had hunted him from court to court. In spite of the indignant protests of Scipio, Rome in the peace negotiations had demanded his surrender from Carthage, and she continued to make this demand of every power that sheltered him. When peace was made with Antiochus III, this was one of the conditions. He was run to earth at last in Bithynia; the king of Bithynia detained him in order to send him to Rome, but he had long carried the poison he needed in a ring, and by this he died. It adds to the honour of the name of Scipio that it was another Scipio, Scipio Nasica, who parodied Cato’s Delenda est Carthago by ending all his speeches in the Senate with «Carthage must stand». He had the wisdom to see that the existence and stimulus of Carthage contributed to the general prosperity of Rome. Yet it was the second Scipio Africanus, grandson by adoption of Scipio Africanus the Elder, who took and destroyed Carthage. The sole offence of the Carthaginians, which brought about the third and last Punic War, was that they continued to trade and prosper. Their trade was not a trade that competed with that of Rome; when Carthage was destroyed, much of her trade died with her, and North Africa entered upon a phase of economic retrogression; but her prosperity aroused that passion of envy which was evidently more powerful even than avarice in the «old Roman» type. The rich Equestrian order resented any wealth in the world but its own. Rome provoked the war by encouraging the Numidians to encroach upon Carthage until the Carthaginians were goaded to fight in despair. Rome then pounced upon Carthage, and declared she had broken the treaty! She had made war without permission. The Carthaginians sent the hostages Rome demanded, they surrendered their arms, they prepared to surrender territory. But submission only increased the arrogance of Rome and the pitiless greed of the rich Equestrian order which swayed her counsels. She now demanded that Carthage should be abandoned, and the population removed to a spot at least ten miles from the sea. This demand they made to a population that subsisted almost entirely by overseas trade! This preposterous order roused the Carthaginians to despair. They recalled their exiles and prepared for resistance. The military efficiency of the Romans had been steadily declining through a half-century of narrow-minded and base-spirited government, and the first attacks upon the town in 149 B.C. almost ended in disaster. Young Scipio, during these operations, distinguished himself in a minor capacity. The next year was also a year of failure for the incompetents of the Senate. That august body then passed from a bullying mood to one of extreme panic. The Roman populace was, even more seriously seared. Young Scipio, chiefly on account of his name, although he was under the proper age, and in other respects not qualified for the office, was made consul, and bundled off to Africa to save his precious country. There followed the most obstinate and dreadful of sieges. Scipio built a mole across the harbour, and cut off all supplies by land or sea. The Carthaginians suffered horribly from famine; but they held out until the town was stormed. The street fighting lasted for six days, and when at last the citadel capitulated, there were fifty thousand Carthaginians left alive out of an estimated population of half a million. These survivors went into slavery, the whole city was burnt, the ruins were ploughed to express final destruction, and a curse was invoked with great solemnities upon anyone who might attempt to rebuild it. In the same year (146 B.C.) the Roman Senate and Equestrians also murdered another great city that seemed to limit their trade monopolies, Corinth. They had a justification, for Corinth had been in arms against them, but it was an inadequate justification.